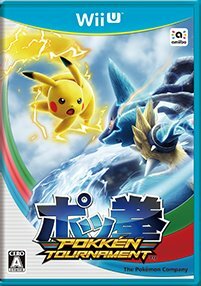 Pokkén Tournament is a fighting game developed by Bandai Namco released in arcades in 2015 and Wii U in 2016. It was first teased at the Pokémon Game Show in August 2013 before an official unveiling in August 2014 by Tsunekazu Ishihara and the game's producers Masaaki Hoshino & Katsuhiro Harada. There are various Pokémon available in this game, including ones that are not Fighting-type and that are not bipeds. In addition to the standard characters you can play as, you can select Support Pokémon to aid you in the battle. This game uses a special controller in the arcade machine, as opposed to a fight stick, and is running location tests in January 2015. Then, in August 2015, it was announced that it would come out for the Wii U.